Intel 1.70GHz 6-Core, RAM 8Gb, HDD None Ship Standard , Smart Array P440ar/2G Controller Module, Qua..
Intel 1.70GHz 6-Core, RAM 8Gb, HDD None Ship Standard, Dynamic smart array B140i , Dual NIC. Do..
Intel 1.7GHz 8-core, RAM 8gb, HDD None Ship Standard, Dynamic smart array B140i, Dual NIC.Do you nee..
Intel 1.70GHz 8-Core, RAM 8Gb, HDD None Ship Standard , Dynamic Smart Array B140i, Dual NIC.Do you n..
Intel 2.10GHz 8-Core, RAM 8Gb, HDD None Ship Standard , H240 Smart Host Bus Adapter, Dual NIC.Do you..
Intel 2.10GHz 8-Core, RAM 8Gb, HDD None Ship Standard , Dynamic Smart Array B140i, Dual NIC.Do you n..
Intel Xeon E3-1220v6 Quad Core (3.00GHz 8MB), Memory 8GB UDIMM, HDD 1TB, Dynamic Smart Array B140iAr..
Intel 3 GHz ,1x16 Gb, HDD 300GB, Dynamic Smart Array B140i, Dual NIC.Are you looking for a compact 1.. Processor : Intel® Xeon® Scalable 3106 (8 core, 1.7 GHz, 16.50 MB, 85W)Memory : 16 GB RDIMM SR 2600 ..
Intel ® Xeon® Scalable 3106 1.7GHz 6-Core, RAM 8Gb, HDD None Ship Standard , Embedded..
Intel® Xeon® Scalable 4110 2.1GHz 8-Core, RAM 16Gb, HDD None Ship Standard , HPE Smart Array&nb..
Intel® Xeon® Scalable 2.2GHz 10-Core, RAM 32Gb, HDD None Ship Standard , HPE Smart Array P..
Do you need a robust server for your SMB and remote offices? 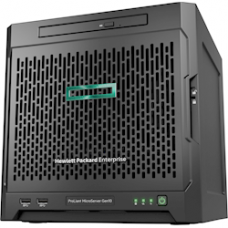 HPE ProLiant ML350 Gen10 Server deliver..